The choice that faced Jack Gomberg ’18: Cirque de Soleil or Pomona? Grow up in a baseball-centric family in the Lakeview neighborhood of Chicago—near the Chicago Cubs’ famed ballpark, Wrigley Field—and start playing tee-ball at 3. Discover that you’re “a little above average” as a toddler-athlete, meaning that you can run all the way to first base without falling down. In kindergarten, attend a hands-on workshop by the nonprofit social-circus group CircEsteem. After failing miserably at juggling scarves, test your sense of balance on a rolling globe—a hard sphere about four feet in diameter—and do so well that the group invites you to join them for practices. Partly because the workshop was so cool and partly to escape the soccer practice you despise, join CircEsteem’s new after-school program and discover an awe-inspiring new world—a cavernous circus ring where kids up to high-school age are performing all sorts of acrobatics on the ground and in the air. At first, stay in your comfort zone with your rolling globe. Then slowly branch out to other circus arts, such as trampoline and partner acrobatics. Avoid two things like the plague: juggling and aerial acrobatics. Conquer your dread of juggling at the age of 8, and two years later, overcome your fear of heights on the static trapeze. See your first Cirque de Soleil—Corteo—at age 12 and realize that the circus can be truly artistic. Then, when world gym wheel champion Wolfgang Bientzle comes to Chicago to create a Team U.S.A. in the sport, catch his eye and fall in love with the gym wheel under his expert tutelage. Win your first national championship in gym wheel at 14 after telling your mom she didn’t need to stay because the competition was “no big deal.” Go to your first World Championships in Arnsberg, Germany, and make friends from around the world while reaching the finals in all three 18-and-under events, including one fourth-place finish. Two years later, apply to Cirque du Soleil to spend a week at their training facility in Montreal, Canada, and get invited to serve as a temporary gym wheel coach for the Cirque du Soleil acrobats. Then, when the World Championships come to Chicago, defend your home turf by winning two bronze medals. While applying for college, also apply to the École de Cirque in Quebec, a feeder school for Cirque du Soleil. Since you know its three-year program is impossibly exclusive, apply for a gap year in its slightly more accessible one-year program. Get accepted to the three-year program instead. Have to choose between a circus life and Pomona. Choose Pomona. 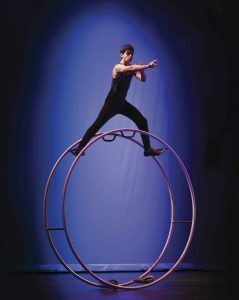 Even before arriving on campus, make arrangements to form a club at The Claremont Colleges because you want to build a community of people with an interest in the circus arts. Name the club 5Circus and serve as its president for three years before, in the name of continuity, letting someone else take over during your senior year.